The Sapphire has decent space between the seat and the handlebars and doesn't weigh too much for simple neighborhood rides. BEST FOR: Our top pick for girls' bikes under $100. 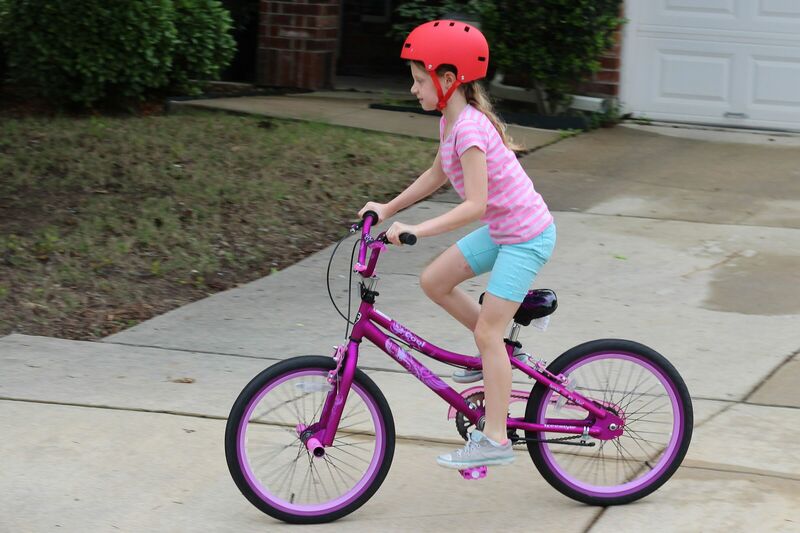 SEAT HEIGHT: 25" – 29.25"
Don’t want to spend more than $100 on a 20″ Girls’ Bike? We’ve got you covered. 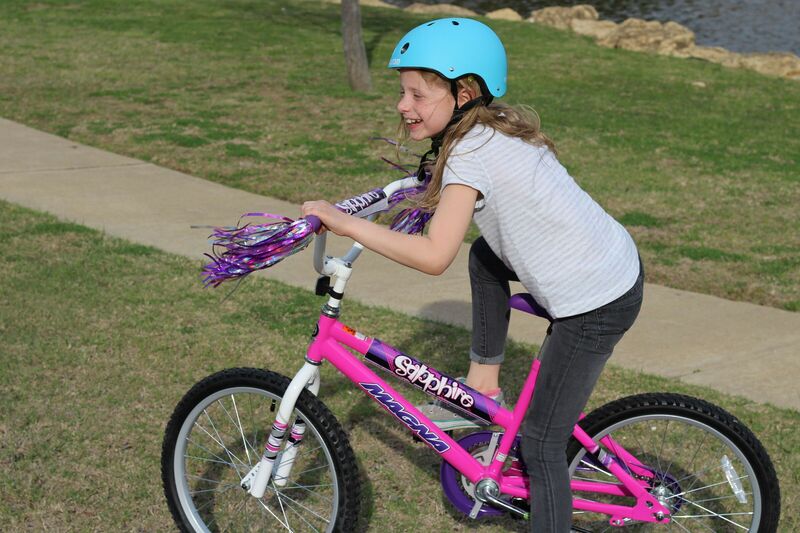 While we’re passionate about recommending bikes that provide the best riding experiences, we also understand that a $280 – $500 price tag for a 20” girl’s bike can leave some parents running for the hills! Reality is, many parents just want a simple, cheap bike that their daughter can use to cruise around the neighborhood and that won’t cost more than a smartphone. We get that everyone has different needs and we’re here to help you get the most for your money! Weight 24.3 lb. 22.6 lb. 29.9 lb. Wheelbase is longer than Huffy, providing more room to ride and a bit more stability Under $50. What?? The Dynacraft Magna Sapphire is our top pick because of its combination of geometry and weight. While not as lightweight as the Huffy, at about 24 lbs, it was still manageable for our testers to ride. And while the space between the seat and handlebars is a little cramped, it's better than that Huffy - at this price point, you can't really expect much better. 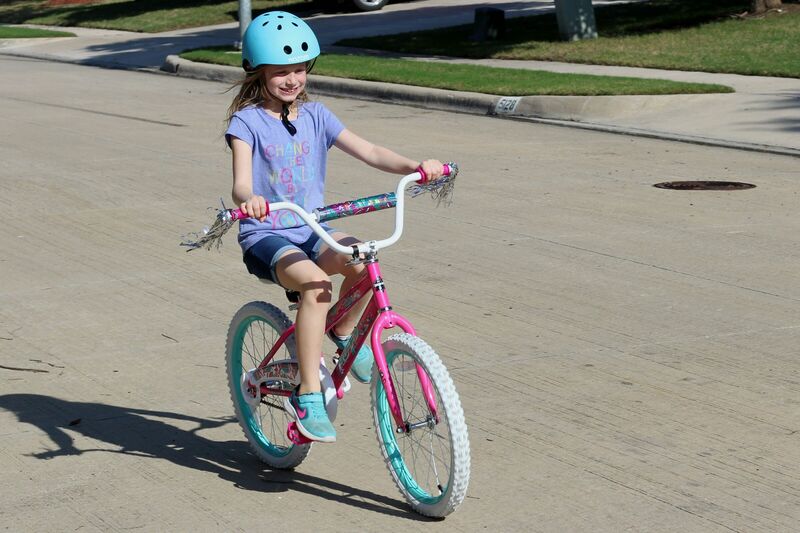 Our testers enjoyed riding the Sapphire for short rides around the neighborhood. As the lightest of the three bikes we tested, Huffy Sea Star was a winner with our testers who found it the "easiest to pedal". But as parents, we weren't a fan of the short wheelbase which brings a rider's knees close to the handlebars and limits stability and control. While it may be easy to ride, it's not your safest bet. Watching our testers ride the Kent 2 Cool, it seemed like a winner! With a longer wheelbase, the Kent is unique in this price range because it gives kids decent room to ride comfortably and maintain better control over the bike. Unfortunately, it wasn't as easy to ride as it looked. The bike is very heavy, and our testers had to exert too much extra effort to make the ride much fun. Now, we don’t want to harp on how much better a $300 girl’s bike is, but we do just want to make sure that you know what you’re giving up when you decide to go for a bike under $100 – just to set expectations. Size is the most important feature to get right when choosing a bike for your child. Seat Height: Kids comfortable riding on a pedal bike (without training wheels) can typically ride a bike with a minimum seat height that is 2 to 4″ greater than their inseam. Unfortunately, budget manufacturers rarely publish their seat height specs, so you’re often just making a lucky guess. Luckily we’ve done these measurements for you so you can buy online with confidence! Standover Height: Of even greater concern is standover height – whether or not there is room between the top tube of the bike and a child’s crotch when straddling the bike in front of the seat. With girls’ bikes, this is generally not a a problem. All three of the bikes we tested had low and slanting top tubes that shouldn’t be an issue for any child big enough to ride a 20″ bike. Minimum Seat Height 25" 25.25" 24.13"
Maximum Seat Height 29.25" 29" 29.5"
Adjustability: The Kent 2 Cool and Huffy Sea Star both sport quick release levers to easily adjust seat height within a matter of seconds, which is a very nice feature for a bike under $100. The Dynacraft Manga Sapphire requires a wrench to make any seat height adjustments. Some truths are simple and obvious: a kid needs room to ride a bike. One of the primary difficulties with bikes under $100 is that they aren’t built in the right proportions for a child. They generally don’t provide enough space between the handlebars and the bike seat (wheelbase measurement), so a child’s body gets crammed together as a result. It’s uncomfortable, and it makes it much more difficult to pedal efficiently and to control and maneuver the bike. As a result, kids on these bikes are going to get tired more quickly and be more likely to lose their balance. Both the Huffy Sea Star and Dynacraft Magna Sapphire are a little cramped but aren’t as terrible as some we’ve seen. The Kent 2 Cool does provide a slightly longer wheelbase and allows kids to spread out and ride a bit more comfortably. Ideally, a bike should weigh less than 40% of a child’s weight. (For reference, most adults ride bikes that are no more than 20% of their weight!). Cheaper bikes traditionally have heavy steel frames which make a 40% threshold very difficult to accomplish. Given that it’s pretty common for kids’ bikes to be about 50% of a child’s weight, both the Huffy and Dynacraft are a decent weight given their price point. The Kent 2 Cool, however, is just too heavy for most kids to be able to enjoy riding for long periods of time, or if they feel the need for speed! By the time a child is on a 20” bike, they are past the point where there should be coaster brakes on their bike. Unfortunately, coaster brakes are much cheaper to produce and are very common on cheaper bikes. The Huffy and the Dynacraft have coaster brakes. While the Kent 2 Cool has a coaster brake and dual hand brakes, the hand brakes are not very usable. They are very difficult to engage, even for an adult! Our testers didn’t even use the hand brakes after a few tries and depended solely on the coaster brake. Bikes under $100 may be better for your budget, but you’re always going to be sacrificing a truly enjoyable ride. The Dynacraft Magna Sapphire is your best bet for a 20″ girl’s bike in this price range. If you’re interested in checking out mid and high-end bikes, read our Kids’ Bikes Comparison Charts and Recommendations page.